Sensor Monitoring might seem like a very technical and boring subject, but this IoT use case was particularly inspiring because we are making a profound difference in the lives of hundreds of thousands of children in Africa. 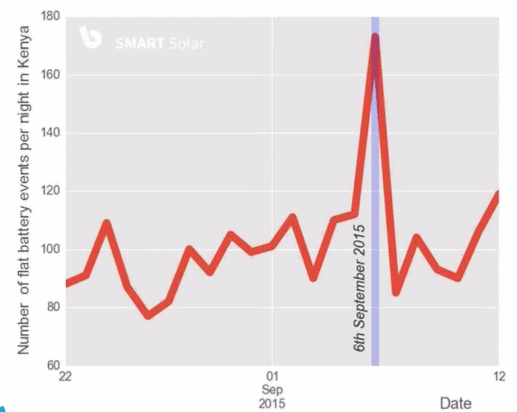 InfluxDB is part of the solution at BBOXX (pronounced “BeeBox”) as it provides affordable, clean solar energy to off-grid communities in the developing world. Consider life in one of these communities where the dominant source of light is from burning kerosene, creating soot and toxic fumes that permeate the home as the family sits together and the children try to study. Clearly, there is a better way, and BBOXX has created an elegant solution — a solar powered “Battery Box” that sits in an individual’s home to power lights and appliances like TVs, lights, and mobile phones. The name, BBOX, is short for “Battery Box.” Now, families can spend quality time together in a smoke-free environment. Read the full use case and watch the webinar. Technology has evolved and BBOXX has been able to overcome these limitations. In particular let’s drill down into one part of their IoT Platform: the need for a storage, visualization and analytics engine that can handle the volume of the metrics and events that were generated. They chose InfluxData’s platform including InfluxDB as their Sensor Monitoring engine for its ability to store, visualize, and perhaps, more importantly, analyze the millions of sensor reading in real-time. The goal is to use this data to improve the customer experience, expand their product offerings, and become a data-driven enterprise. For instance, when looking at Battery performance one might be tempted to just stop at a simple graph showing power consumption over time. But what BBOXX really wanted to do was use the data to predict battery failures (predictive maintenance), before the failure occurred. 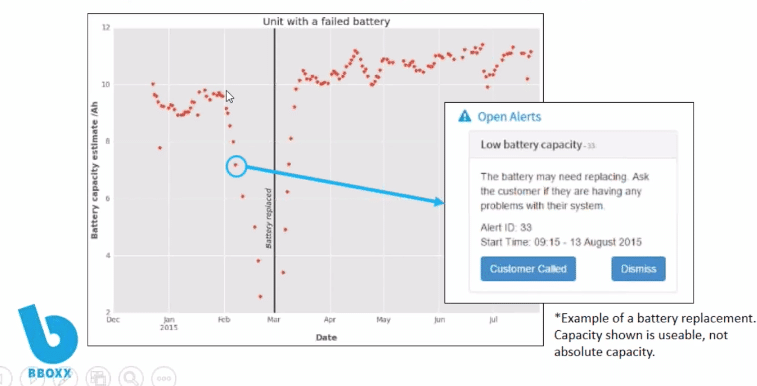 The system creates a proactive alert to the customer service team to dispatch a new battery before the system fails. 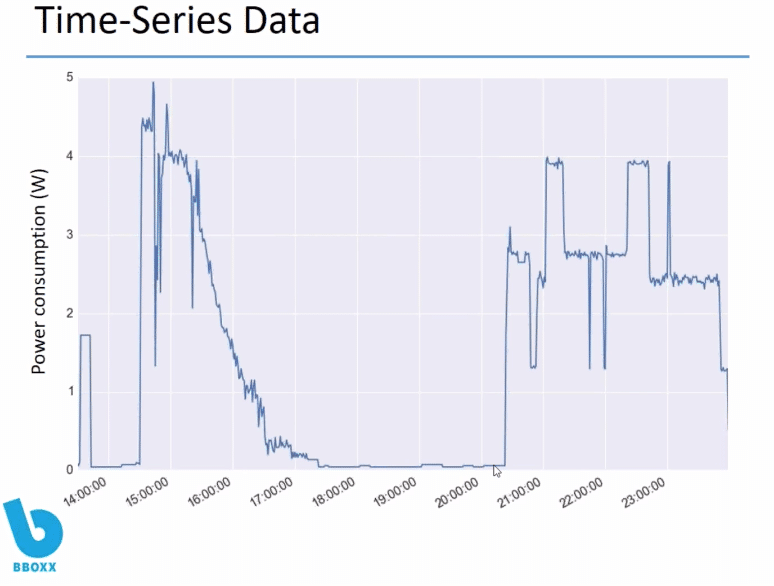 This whole move from monitoring to alerting and eventually to control, where the system can automatically ship the battery, for instance, is a trend we see across our IoT Monitoring customer base. Increase sales by creating compelling incentives for customers to get their products before major events and increase battery capacity on units to handle peak demand. InfluxData has allowed BBOXX to become more of a data-driven business, something that will provide competitive differentiation for years to come. We at InfluxData can not be happier that we play an important part in the work BBOXX is doing to change the world and we would love to hear how you are using our technology to make a difference.